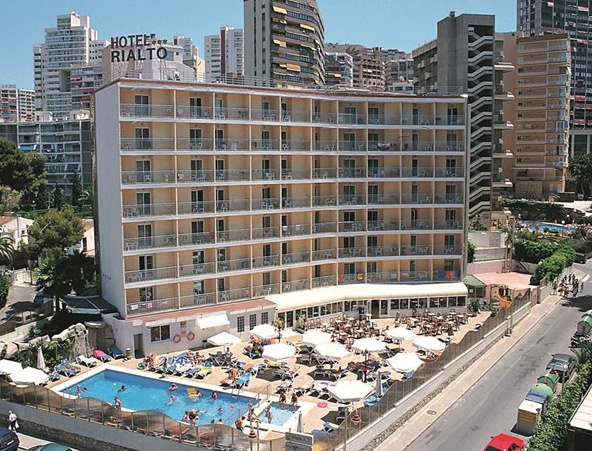 The ever popular 3 star Hotel Servigroup Rialto is situated in a quiet area of the Rincon de Loix area of Benidorm. 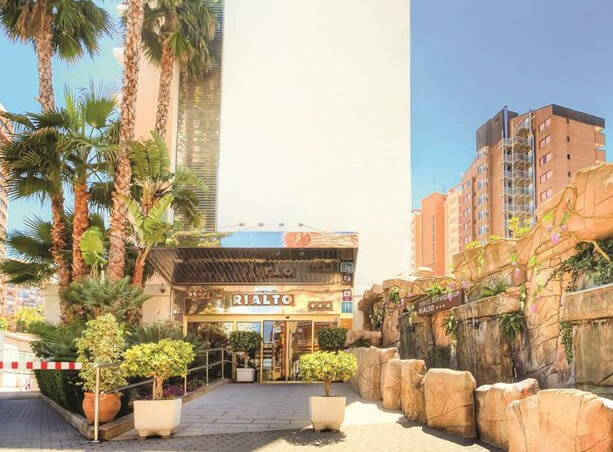 There are plenty of shops, bars and restaurants close by and the golden sands of the resort's Levante are just a 300 metre stroll away. This ever popular hotel offers a relaxing, friendly atmosphere that’s suitable for families and couples alike. Transfers take around 45 minutes to make the 35 mile journey from Alicante airport. The Servigroup Rialto hotel has 133 comfortable bedrooms: These guest rooms have air-conditioning/heating, fully equipped bathroom with hairdryer, balcony, direct dial telephone, mini fridge, safe (supplement) and intelligent locking system. There is a flat screen TV that provides a new digital system with 60 national and international channels and 15 music channels. There is Free Wi-Fi in the rooms. Twin rooms sleep up to 3 adults. Single rooms and twin rooms for Sole Use are also available. 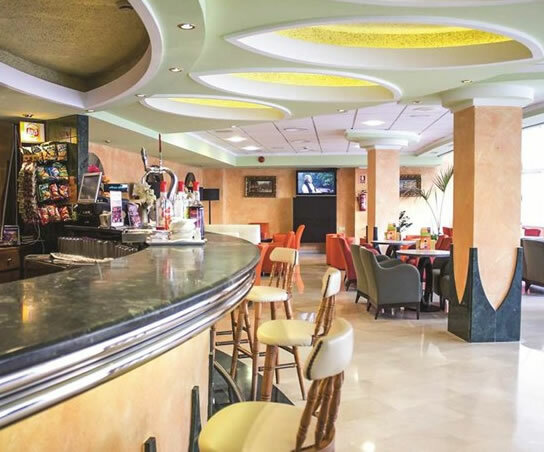 The hotel has a buffet restaurant with a select and varied range of hot and cold dishes including themed local and international dishes, vegetarian choices and delicious desserts. The hotel is proud of its tradition of 'Show cooking' where delicious high quality fish and meats are prepared on an open grill all cooked in front of the hotel guests. The restaurant offers a variety of menus which are changed on a weekly basis in the summer and every 15 days in winter. The Lounge bar Venecia is the venue for that relaxing cocktail or two. The Rialto has a suuny terrace with swimming pool for adults and a separate children's pool (electrolysis disinfection). The pool is surrounded by sunbeds and parasols and there is bar service to the pool. 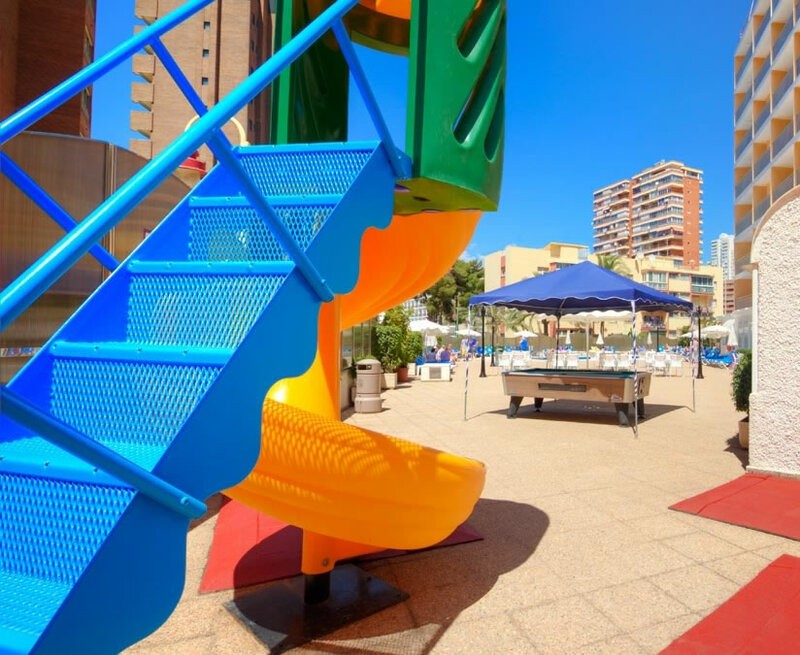 The hotel also provides a Children’s playground. During the summer season there is an evening entertainment programme that includes dancing and live music. Free Wi-Fi throughout the hotel. There is also a games room. The Hotel provides a range of facilities to provide you with everything for a great holiday including a 24 hour reception. Free Wifi is available throughout the hotel. There is a computer with internet access in the reception area (supplement). The hotel has 7 lifts, also the Rialto has a limited number of parking spaces these are available at a supplement. It is also possible to exchange currency, there is a fax service, and car rental desk (you can always pre-book your car rental before departure please ask us for a quote!